From the industry leading .NET charting component, now comes the Chart for .NET Community Free Edition. The free charting solution for your .NET application development. A free charting solution, powered by the industry leading .NET charting component. With Nevron Chart for .NET Community edition you will be able to add charting functionality to your Windows Forms, WPF and ASP.NET applications. Not only that, but you will be able to use the Chart control to create both Desktop and Server applications from a single code base. A Bar Chart displays a sequence of horizontal or vertical bars of lengths proportional to the value that they represent. Bar charts are used for comparing two or more values. Horizontal Bar Chart - the Chart control has built-in functionality for automatic configuration of left-aligned and right-aligned horizontally oriented charts. The XY Bar Chart provides XY scatter functionality. The XValues data series contains double values that determine the positions of the data points along the X axis. XY Bar Chart with horizontal orientation. The Chart control has built-in functionality for automatic configuration of left-aligned and right-aligned horizontally oriented charts. The DateTime Bar Chart is a chart series with custom DateTime values along the X axis. DateTime Bar Chart with horizontal orientation. The Chart control has built-in functionality for automatic configuration of left-aligned and right-aligned horizontally oriented charts. Cluster Bar charts are composed of several bar or float-bar series. The data points from the same category are displayed side-by-side, forming "clusters" along the X axis. This representation is convenient when you need to compare the Y values for a given category or X value. Clustered Bar Chart with horizontal orientation. The Chart control has built-in functionality for automatic configuration of left-aligned and right-aligned horizontally oriented charts. A Stacked Bar chart displays several series stacked so that there is a single column for each category. The height of each column is determined by the total of all series values for the category. Stacked Bar Chart with horizontal orientation. The Chart control has built-in functionality for automatic configuration of left-aligned and right-aligned horizontally oriented charts. A 100% Stacked Bar chart displays all series stacked in a single column for each category. The height of each column is always the full height of the chart. The series values are displayed as percentages of each column. The Y scale range is always from 0 to 1 (0 - 100%). Stacked Percent Bar Chart with horizontal orientation. The Chart control has built-in functionality for automatic configuration of left-aligned and right-aligned horizontally oriented charts. 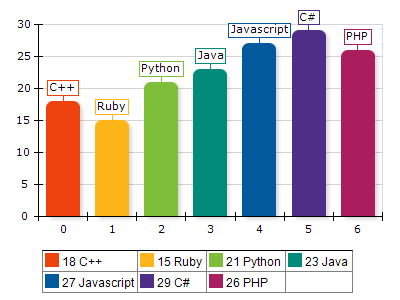 A Stacked Bar Chart with XY scatter functionality. The XValues data series contains double values that determine the positions of the data points along the X axis. XY Stacked Bar Chart with horizontal orientation. The Chart control has built-in functionality for automatic configuration of left-aligned and right-aligned horizontally oriented charts. A Cluster Stack combination with XY scatter functionality. The XValues data series contains double values that determine the positions of the data points along the X axis. XY Clustered Stacked combination with horizontal orientation. The Chart control has built-in functionality for automatic configuration of left-aligned and right-aligned horizontally oriented charts. 2D Bar Charts including - Clustered, Stacked, Stacked%, XY scatter stack and XY scatter cluster bar modes. Smooth edge and cut edge bar styles as well as the standard pyramid, cylinder, ellipsoid, cone, inverted pyramid and inverted cone styles. Support for cluster stack combinations. Area charts depict changes of values, usually over time. They are similar to Line charts, but emphasize the trends by filling the area between axis and line. Area Chart with horizontal orientation. The Chart control has built-in functionality for automatic configuration of left-aligned and right-aligned horizontally oriented charts. A Stacked Area chart displays related data groups, one on top of the other. It is used to show how each group contributes to the total as well as the trends of the total, usually over time. The series are displayed as sequences of straight line segments and the area below each line is filled. Each area series is stacked on top of the previous one. The height of the uppermost line depends on the total value for each category. Stacked Area Chart with horizontal orientation. The Chart control has built-in functionality for automatic configuration of left-aligned and right-aligned horizontally oriented charts. Stacked Percent Area charts represent the relative contribution of data series to the total for each category. The series are displayed as sequences of straight line segments and the area below each line is filled. Each area series is stacked on top of the previous one. The height of the uppermost line is always the full height of the chart. The Y scale range is always from 0 to 1. Stacked Percent Area Chart with horizontal orientation. The Chart control has built-in functionality for automatic configuration of left-aligned and right-aligned horizontally oriented charts. The XY Area Chart provides XY scatter functionality. The XValues data series contains double values that determine the positions of the data points along the X axis. XY Area Chart with horizontal orientation. The Chart control has built-in functionality for automatic configuration of left-aligned and right-aligned horizontally oriented charts. The XY Stacked Area Chart provides XY scatter functionality and displays related data groups, one on top of the other. The XValues data series contains double values that determine the positions of the data points along the X axis. XY Stacked Area Chart with horizontal orientation. The Chart control has built-in functionality for automatic configuration of left-aligned and right-aligned horizontally oriented charts. The XY Stacked Percent Area Chart provides XY scatter functionality and represent the relative contribution of data series to the total for each category. The series are displayed as sequences of straight line segments and the area below each line is filled. Each area series is stacked on top of the previous one. The height of the uppermost line is always the full height of the chart. The Y scale range is always from 0 to 1. XY Stacked Percent Area Chart with horizontal orientation. The Chart control has built-in functionality for automatic configuration of left-aligned and right-aligned horizontally oriented charts. The DateTime Area Chart is a chart series with custom DateTime values along the X axis. 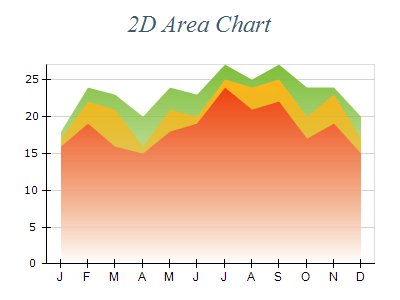 2D Area Charts including - horizontal Area orientation, Stacked and Stacked% multi area modes are supported. XY Scatter mode. Supports markers. A Line Chart displays a sequence of data points connected by a line. Consecutive points are connected with straight line segments. Developers can use an unlimited number of chart series within Nevron Chart for .NET. A Stacked Line chart displays related data groups, one on top of the other. It is used to show how each group contributes to the total as well as the trends of the total, usually over time. The individual series are displayed as sequences of straight line segments. Each line series is stacked on top of the previous one. Stacked Percent Line charts represent the relative contribution of data series to the total for each category. The series are displayed as sequences of straight line segments. Each line series is stacked on top of the previous one. The height of the uppermost line is always the full height of the chart. The Y scale range is always from 0 to 1. XY Scatter line charts are created by instructing the line series to use custom x values for the line data points. The XY Stacked Line Chart provides XY scatter functionality and displays related data groups, one on top of the other. The XValues data series contains double values that determine the positions of the data points along the X axis. The DateTime Line Chart is a chart series with custom DateTime values along the X axis. 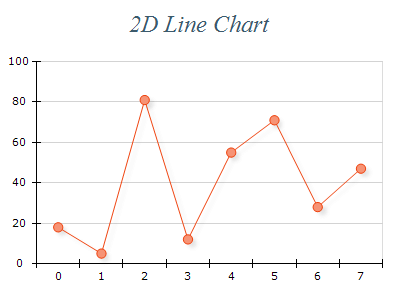 2D Line Charts including - horizontal Line orientation. Line series can be displayed as simple lines, tape, tube or stretched ellipsoids. Overlapped, Stacked and Stacked% multi line modes are supported. XY Scatter mode. A Pie Chart is a circular chart divided into sectors, where the arc length of each sector is proportional to the quantity it represents. Pie Charts are convenient when you need to compare the value for a given category with the total. A Pie Chart with Ring shape (Donut Chart). Half Pie Chart (180 degrees) with begin angle set to 0 degrees. Pie Chart with detached segment. Control over the pie segments detachments from the pie center. 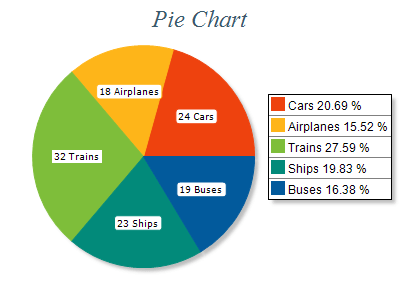 An example of several custom Half Pie charts within a single chart control. 2D Pie Charts - standard and torus (donut) pies. Pie data labels - rim, center or spider modes. Support for exploded, sorted and grouped pies. Nevron Chart has a styling mechanism that uses the same core concepts as CSS2, but is much simpler and specific to the component requirements. Furthermore the styling mechanism is open for extension, so you can modify it according to your needs. The component also provides a way to automatically build a style sheet using style sheet configurators and predefined color palettes. I used the Nevron chart control to produce a series of charts on a scheduled basis within a .NET console program. This is still working very well and saved my client some $30,000 per year in charges from an external charting company.